^ 1.0 1.1 1.2 1.3 1.4 We Are All Safer: Lessons Learned and Lives Saved 1975-2005. 3rd ed. Safety Report NTSB/SR-05/01. (PDF). National Transportation Safety Board. [December 18, 2015]. ^ 3.0 3.1 3.2 3.3 Office of the Chief Records Officer. Records Management Oversight Inspection Report 2014 (PDF). 国家档案和记录管理局. December 19, 2014 [December 20, 2015]. ^ 4.0 4.1 NTSB Training Center. National Transportation Safety Board. [December 20, 2015]. ^ 5.0 5.1 5.2 History of The National Transportation Safety Board. National Transportation Safety Board. [December 20, 2015]. ^ 8.0 8.1 A Brief History of the FAA. Federal Aviation Administration. [December 20, 2015]. ^ 9.0 9.1 9.2 9.3 National Transportation Safety Board. The Free Dictionary. [September 15, 2014]. ^ 10.0 10.1 10.2 10.3 10.4 Annual Report to Congress 2014 (PDF). National Transportation Safety Board. [December 18, 2015]. ^ The Investigative Process. National Transportation Safety Board. [December 20, 2015]. ^ NTSB Providing Technical Assistance to FBI Investigation (新闻稿). National Transportation Safety Board. September 13, 2001 [December 19, 2015]. ^ Horikoshi,Toyohiro. 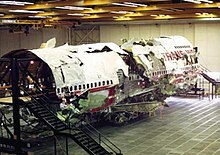 "U.S. leaked crucial Boeing repair flaw that led to 1985 JAL jet crash: ex-officials." Japan Times - Kyodo. (August 11, 2015). ^ 18.0 18.1 What is the National Transportation Safety Board? (PDF). National Transportation Safety Board. [May 11, 2016]. ^ 19.0 19.1 19.2 19.3 Michael Ferguson; Sean Nelson. Aviation Safety: A Balanced Industry Approach. Cengage Learning. 2012: 37. ^ 21.0 21.1 21.2 Alvear, Michael. Crash course in ethics. Salon. December 6, 1996 [May 11, 2016]. ^ 22.0 22.1 22.2 Safety in the Skies: Personnel and Parties in NTSB Aviation Accident Investigations (PDF). 兰德公司. January 1, 2000. ^ Unchecked carnage: NTSB probes are skimpy for small-aircraft crashes. 今日美國. June 12, 2014 [May 11, 2016]. ^ 24.0 24.1 Office of Administrative Law Judges. National Transportation Safety Board. [December 21, 2015]. ^ Ferguson v. National Transportation Safety Board , 678 F.2d 821 (9th Cir. 1982). ^ Accident Investigations - NTSB - National Transportation Safety Board. National Transportation Safety Board. July 17, 1996 [February 22, 2013].